ROUGH ANGEL rings no bells to me. These recordings were released in 1993, exclusively to promoters and the record industry. Vocalist Csaba Zvekan has remastered the recordings to be a first digital release of Rock´n´Growl. Back in 1993 the material must have been like a violin player in a punk band, will they send shivers down our spines in 2011? The info claims the music to be like lava, and the opener “Standing by Mirrors” is perhaps lavalike to fans of JUDAS PRIEST or VIRGIN STEELE. But the music also has an element of glue, oddly under-produced and with the typical American fascination for heaviness over melody. Second track “Desire” proves my point, adding only a dimension of running on empty non-OZZY BLACK SABBATH to the mix. The final two songs really turn the band´s fortunes. “Let It Burn” has a one of the most simple and stubborn refrains ever, but also a distinctly more European flavor, which does ROUGH ANGEL a world of good. 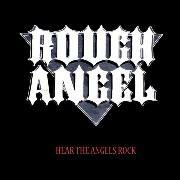 The production is also significantly improved, and the final accolade of “Hear the Angels Rock” is a serious contender of the hearts of heavy metal fans. The sheer vocal mastery and the precise dose of eyebrow raising refrain and not too complex level of musicianship have the making of a hit, at least in the right age. I wonder if this is the right age, and how to reach the masses with this very track? The album is a 50% winner, I hope that is enough to gain some attention.